It remains completely up in the air to a certain exent but it does appear as though Nick Diaz is set to return to the octagon for the first time in over four years. Here’s why you should care. Brett Okamoto of ESPN provided the MMA world with the pretty surprising revelation in November when he confirmed the UFC were close to setting up a welterweight showdown between Nick and ninth-ranked Jorge Masvidal at UFC 235 in March. In the time since, Diaz himself has spoken out against both Dana White and the UFC frequently – leading many people to wonder at how likely it is that we see him in action again. And while he remains an incredible popular figure within the MMA community, a lot of people have taken the wrong approach in attempting to understand Nick. Sure, you could look at his record, his inactivity of late, or the fact that he hasn’t won a fight since 2011 and then type your comment, shut up shop and move on with your life. If you want to take that stance and bask in how correct you are, then by all means, stop reading and enjoy your limited perspective on one of the most electric fighters in the history of mixed martial arts. Most of the arguments against Nick being a great fighter are 100% factually accurate. I’m not going to sit here and dispute the fact that he came up a long way short in the biggest fight of his life against Georges St-Pierre or that his single-minded approach makes him quite a bit more manageable if simply you don’t play his game. If your direct counter to any praise for Diaz is to point to his patchy record against the established welterweight greats or to scoff at his inactivity – go for it. That’s your loss. 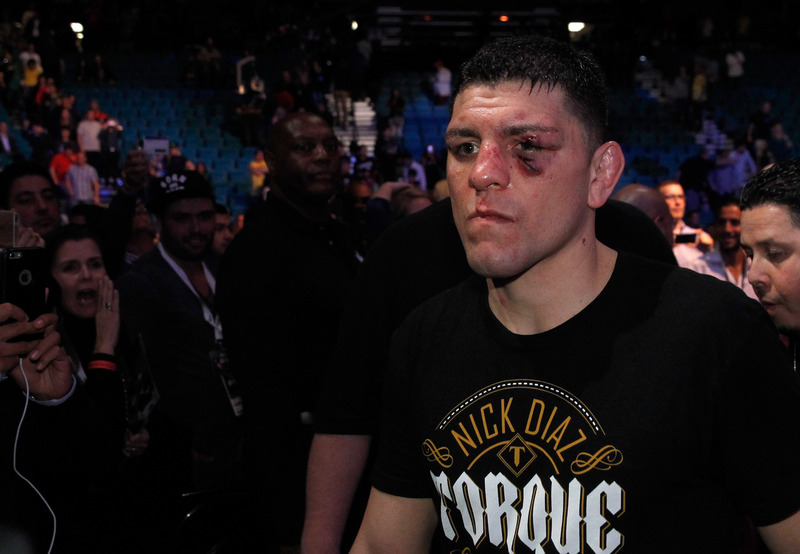 But trust me when I say, Nick Diaz has proven himself to be legendary in every sense of the word. The story of the elder Diaz brother has been an odd one that strays far from the path and expected rhythms of a regular athlete’s road through this game. A veteran of the top-levels of the fight game for over a decade, Nick’s original run in the UFC between 2003 and 2006 was a mixed bag – although his second-round KO of the future-champion Robbie Lawler in 2004 may still be my favourite fight of all-time. He messed with all of our expectations by abandoning what many had seen as his clear route to victory with his grappling, instead slapping and taunting the fiery powerhouse until he became emotionally compromised. But it wasn’t until he departed the UFC directly after TKO’ing Gleison Tibau at UFC 65 that we witnessed the golden period of his career. His post-UFC run began with an immediate title-shot against one of the world’s pound-for-pound best at the time, Takanori Gomi (27-3) – back when he was at the absolute peak of his powers. 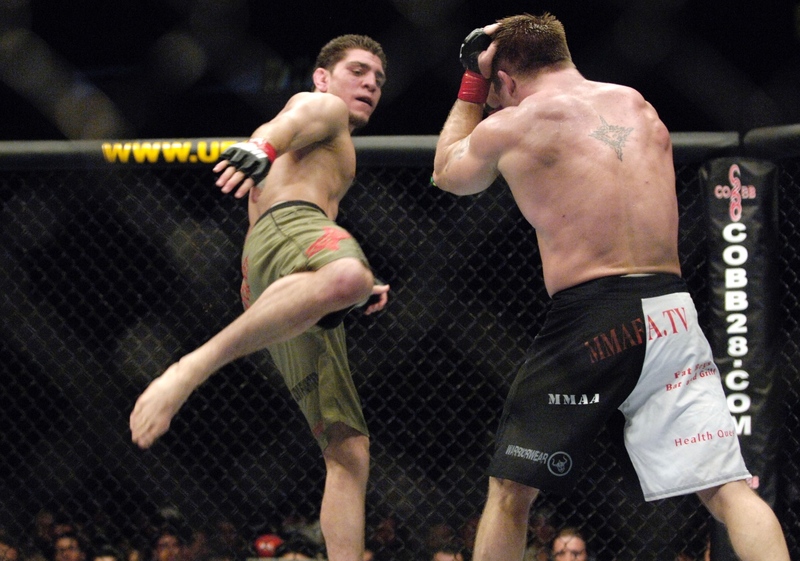 The resulting bout between the American and ‘The Fireball Kid’ was what would soon become a prime example of a Nick Diaz fight. Like so many who followed him, Gomi went toe-to-toe with Nick from the first bell but just couldn’t hang in there as his opponent pressed forward. 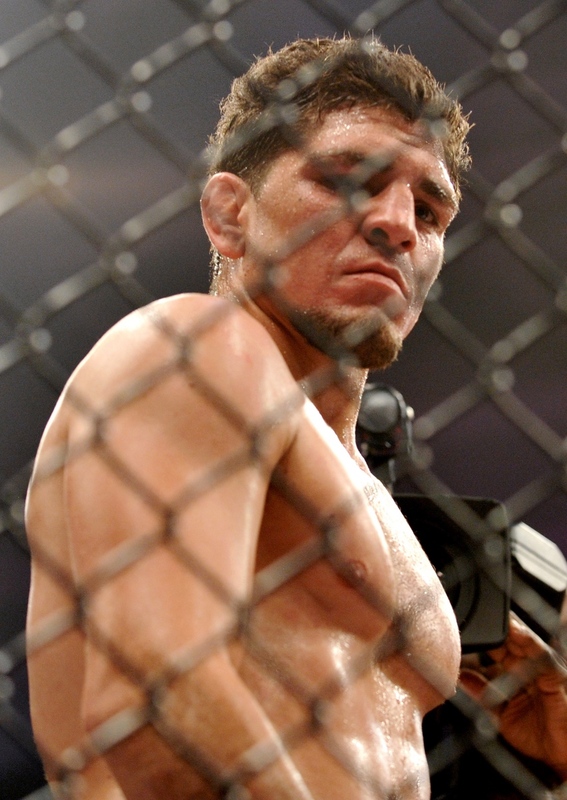 When the second round came, a combination of exhaustion, damage, and desperation caused him to shoot in on a desperate takedown, one that Diaz conceded before quickly locking up his man in one of MMA’s rarest submissions, the gogoplata. The fight would later be declared a no-contest after Diaz failed a drug-test for marijuana, with the widespread word suggesting that there was so much THC in his blood at the time that there was absolutely no way he wasn’t stoned mid-fight. We’d see this blueprint time and time again as he continued his run on the global scene. 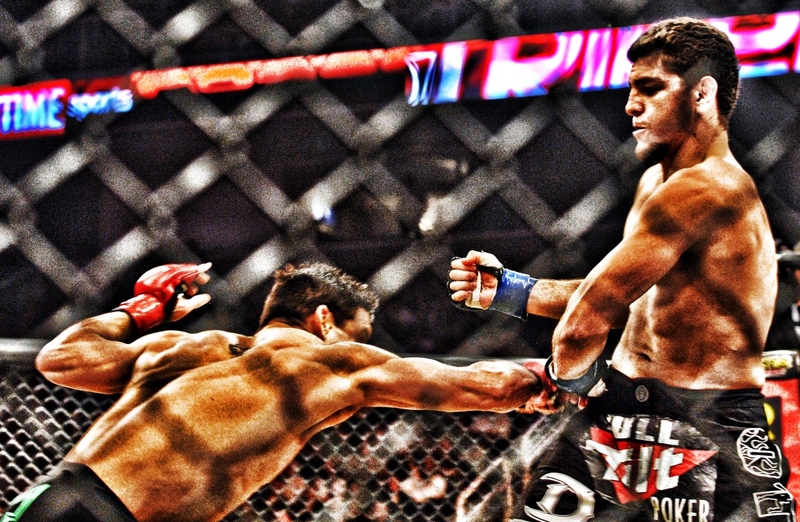 In Strikeforce’s welterweight division – which was absolutely stacked with several future UFC stars at the time – Diaz went 6-0 and defended the belt on three different occasions with the same approach. Zaromskis, Santos, Shamrock, Noons, and of course, Paul Daley, each of them were thrilling matchups and more importantly, each of those guys completely failed to crack his chin, his cardio, and that ever-improving boxing technique. Nowadays, and especially after UFC 202, his brother Nate’s own chin, cardio and ability to recover has been elevated into that legendary category but overall, I think Nick is the superior fighter. He’s more powerful with his punches, more crisp in his technique, a more dynamic grappler and above all else, his endurance levels are just on another level. When he returned to the UFC and put an almighty beating on BJ Penn back in 2011, he would fight three more times against Carlos Condit, Georges St-Pierre, and Anderson Silva, going 0-3. Each of these guys beat him by refusing to play his game. Condit, in particular, had great success sticking and moving – putting any urge to stand and trade to one side in order to get the win. And these guys deserve credit, of course. Most, in fact, all who had tried to swim with Nick since his original run in the UFC had sank under his pressure, so why bother attempting to if you can secure the win? That’s what this game is all about. It does irk me, though, when you hear people attempting to put him down for his losses against those three legends of the game and dismissing him entirely because of that. Those who take that outlook are missing the point. It may well be a case that a lot of the newer fans to this sport will take 30-seconds to look him up on Wikipedia and then have their pre-written response in the back-pocket every time he makes a ridiculous comment when TMZ corner him as he stands drunk outside a night-club. I’d implore each and every one of you to dig past the surface. Depending on when you catch him, he can be a mess of angsty social awkwardness or if you’re lucky, his clear intelligence and razor-sharp wit will come to the fore. As one of the most likeable and completely genuine personalities in the sport, it’s a combination of these traits and his completely unmissable offensive-approach that have endeared him to fans over the years and while it’s easy to roll your eyes every time his name pops up on your timeline, it’s a lot more fun when this guy is your favourite fighter, trust me on that.